Occupy protesters at the state capital. Lincoln’s actually doing really well with the protests. Turns out camping is legal on Centennial Mall, so there has been no conflict between protestors and occupiers. 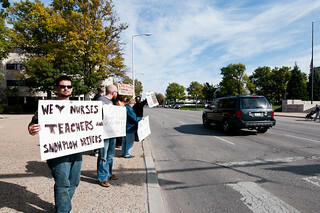 This is in complete contrast to Occupy Omaha, where the police say Go away! and the occupiers say No!…Well, okay.